Possible meat and real bones. “I still don’t think we need him,” Kutta growled. She had said this a few times before, that night, but now she seemed to feel the need to say it particularly loudly, as Biscuit was slinking along ahead of her, rump tucked low. Mhumhi did not bother to contradict her. Rather, he walked beside her with his tail waving and his tongue hanging out. He had got Kutta to agree to go with him with little difficulty, especially after she had learned that they would be traveling with the domestic; he suspected she’d been looking forward to an opportunity to vent some of her frustration. She had even suggested to Mhumhi that they go without any intention of moving the puppies at all and instead shove Biscuit into one of his master’s snares. Mhumhi had not been entirely sure whether this was in jest or not. Biscuit had responded to her aggression by reverting to the state in which they’d first seen him- the overly-humbled, pathetic creature that had been cowed by a golden jackal. Mhumhi had been thinking that it had all just been an act, but now he wondered if it was just a state that came naturally to him. Regardless of it all he had to admit that Biscuit had been a great help to them. Maha and Tareq had reacted to the cardboard box with delight and had devoured its contents with gusto. The contents within appeared to be little crunchy bars formed with something sticky and sweet. Maha had offered one to Mhumhi, but it had just gotten stuck in his teeth. Biscuit suddenly stopped short, and Mhumhi and Kutta froze. There was a streetlamp nearby and Mhumhi just caught a glimpse of a dark-furred tail as he heard the retreating sound of pattering paws. “They could track us,” Mhumhi pointed out. “Then don’t pee on anything,” said Biscuit. Kutta gave him a yellow-eyed stare for this and he resumed tucking his tail and slinking. “I won’t tell you what I’m thinking,” Kutta replied, not bothering to keep her voice down. They went on, slipping through the shadows and skirting streetlamps. Biscuit was leading them somewhat out of Oldtown, though by the opposite way that Mhumhi and Kutta had gone to encounter the wolves in the giant store. Mhumhi thought they might be getting close to Zoo Park, in his hazy mental map. He was glad his back leg had been feeling better, and Kutta seemed to be keeping up all right despite her cough. The journey was dredging up unpleasant memories of the night after Sacha had died. The area they were traveling through was full of squat, featureless brick buildings, sort of like the school. Except occasionally there were also shiner, more modern-looking buildings that put Mhumhi in mind of the dispensary. Biscuit had led them to leap over several short chain-link fences to enter the area, and now Mhumhi saw that there were numerous little kiosks with wooden partitions like the one he and Kutta had seen near the parking garage. “Do you know what this place is called?” he asked Biscuit, trotting a little to catch up with him. “Did she,” said Kutta, in a clipped way. Mhumhi wagged his tail a tad nervously. They came to another fence, this one very tall with barbed wire at the top. Biscuit sniffed along the length of it until they came to the gate, then rose and pushed it open with his weight. There was a cut padlock dangling from the clasp; Mhumhi glanced at it uncomprehendingly. “It’s this building,” said Biscuit, and walked along the brick wall until they came to a little patch of dirt. Here he spent a good long while sniffing about until he suddenly began digging. Mhumhi and Kutta watched him blankly. “Is he planning on digging his way inside?” Kutta asked. Biscuit stuck his nose in the dirt and came out with something small in his teeth. He dropped it on the ground in front of himself- it was a small white card. He picked the card up again and led them beck through the gate around to the front of the building, where there was a solid-looking door. Next to the door was nailed a featureless gray pad, and underneath that, a smaller blue pad with a white squiggle on it. Biscuit reared up next to the grey pad with the card in his mouth. Something beeped, and a light flashed. He glanced back at Mhumhi and Kutta significantly- they were both still entirely bewildered- and pushed on the blue pad with both paws. Much to their surprise, the door swung open seamlessly. Biscuit dropped the card to speak again. “‘An ordinary wild dog,’” Kutta muttered. “Then how did you come across it?” asked Kutta. “Lucky for us,” Mhumhi said, nudging her with his shoulder. The heavy metal door began to slowly swing closed, and Biscuit jumped to his feet. “Come on,” he said, snatching up the white card in his jaws again, and they followed him inside. The door swung shut behind them, cutting off what little light there was from the streetlamps. Mhumhi blinked for a moment in the darkness. There were very faint stripes of light up ahead. They heard the clatter of Biscuit dropping the card to talk again. Mhumhi realized he was right when he immediately ran into something hard. It felt and smelled like a large, heavy cardboard box. There seemed to be stacks of them all around the room, creating a sort of maze; when Mhumhi tried to navigate it, the faint stripes of light completely disappeared. The three of them bumped around for a minute. The place smelled strongly of paper, Mhumhi thought, and there was a kind of strange moistness in the air. He could hear water trickling somewhere nearby. “I found the light,” Biscuit called, and Mhumhi squeezed his eyes shut just in time before the place lit up in a dazzle of white. She jumped down. One of the boxes followed her with a sloppy-sounding thud. Papers slid out of it in great piles. “I’ll pee on them if you talk to me like that again,” said Kutta, and he pressed his jaws shut. Mhumhi took the opportunity to nose at the papers, but he saw no pictures on any of them. Just more of the blurry black squiggles that Maha had said could talk to her. He followed her, scrambling and scratching over the boxes. Biscuit was walking through a doorway ahead of them that led into a long hallway with doors on either side. Down this way, the ever-present trickling seemed to get even louder. Mhumhi rotated his ears, trying to pinpoint it. It was coming from somewhere ahead and to their left. As they left the room with boxes behind them it got dimmer again. They were passing windows with blinds over them, the source of the stripes of light Mhumhi had seen. Mhumhi could see flickering shadows cast on the hallway wall, waving patterns. The air felt wet and heavy. Biscuit led them around the corner and stopped. When Mhumhi followed him, he saw why: the room ahead of them was partially flooded, water just starting to slop over the doorstop. From the paneled ceiling above he could hear a faint trickling sound, and in several places there were dark spots that dripped. “Not such a good hiding place anymore, then,” said Kutta. “A hulker’s hands can easily fix this sort of thing,” said Biscuit, though he kept his tail tucked. He stepped gingerly into the shallow water, which seemed to be no deeper than a puddle. “Why are you going down there?” Mhumhi asked, eyeing the water doubtfully. It looked clean, but he was never in a hurry to get his paws wet. Kutta exchanged a look with Mhumhi, but Mhumhi went ahead and stepped into the water. It was surprisingly cold. They followed Biscuit through the room. It was a sort of odd room, with a lot of low counters and sinks. There were a great many wheeled chairs, several lying on their sides. They smelled like rotten fabric from the water, and Mhumhi saw that there was pale yellow moss growing on several of them, creeping upwards. There were a lot of things on the counters that he could not identify- large plastic boxes, clear plastic tubes, paper tacked to the walls. Biscuit went to flick the light switch with his nose, but it appeared that the water had shorted it. They were left in a peculiar wet gloom, the shuttered windows letting in thin bands of light, and the water casting flickering shadows on the walls. There were several more doors leading out of the flooded room, and Mhumhi stopped short at one of them. “Look, Kutta,” he said, and she turned her head. The door opened to a room that held a rack of cages. “Not that way,” Biscuit said, coming back towards them, but Mhumhi went forward curiously, sniffing. There was water dripping in here, and drops were slithering down the metal, which was beginning to rust in spots. But it was not flooded- the floor had a drain in it. Mhumhi stepped into one of the open cages, sniffing- it was quite large. There was a vague scent about it, not one he really recognized, more of a suggestion of history, of something that had been forgotten. “Look, Mhumhi,” Kutta called, and he stepped out of the cage and joined her in front of another. This one was shut, and there was a little plastic dish tacked on the outside, and a plate on the front that Mhumhi couldn’t read. Kutta was looking further in, where there was a small pile of bones. “Something died in here,” she said. “It must have been a long time ago,” said Mhumhi, peering at them- they were in the corner, and covered in what seemed to be a thick layer of dust. “Those have always been here,” said Biscuit, who had come up behind them. “At least, as far as I know. Must be from before…” He trailed off, seeming reluctant to say more, but Mhumhi thought he knew the event he was referring to. “They must have come from a big dog,” said Kutta, eyeing a long pale femur. Mhumhi reared up to get a better look and was surprised to feel the metal front of the cage sliding under his paws. “It’s not even secured,” he said, getting down, and used his nose to push it the rest of the way open. 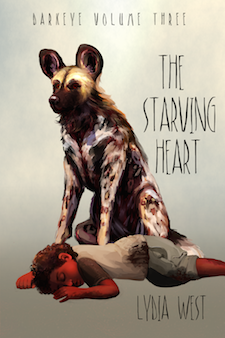 “Be careful, Mhumhi,” said Kutta, tail rising as he entered to sniff the bones. He did feel a brief pang of anxiety- what had led someone to die here, in an unlocked cage? But the bones were quiet, calm even, gently nestled together, like their owner had been curled up. Mhumhi nosed through the dust and sneezed. “It wasn’t a dog,” he said, and picked up the skull in his teeth to show them. It was domed, the muzzle flat. “A hulker!” exclaimed Kutta. Biscuit said nothing, though he glanced away. Mhumhi put the skull down, grimacing a bit from the dusty taste of it. Mhumhi and Kutta exchanged another look, for the domestic’s tone had been strange, but there were no obvious conclusions they could draw from it. They followed him together back out of the cage room, Kutta drawing her brushy tail along Mhumhi’s side to comfort him, or perhaps to comfort herself. What Biscuit wanted to show them seemed to be at the very back of the long room, on a wall upon which was suspended a strange rack of hanging metal frames. Each frame was cross-divided into a number of tiny sections, and there were masses of wires running from it in every direction, some lying in the water on the floor. Mhumhi gazed at it without comprehension. Mhumhi tilted his head and looked at the wobbling frame more carefully. There was a clip at the top, and behind it, a narrow rubber chute. That had been Kutta, who was now trotting and splashing along the length of the thing, eyes wide. Mhumhi gazed up at the silent racks. If they had had access to this sort of thing before, his entire family might still be together. “Why didn’t you tell us about this in the first place?” Kutta demanded. “Because I did not think you would believe me. I thought it would be better to show you.” Biscuit’s curled tail wagged slightly. Or because you thought it would be very dramatic, thought Mhumhi, eyeing him. And impressive. “Really,” said Kutta, who was beginning to sound very interested. Mhumhi glanced at her, then back at Biscuit. His jaw had gone slightly slack, his pale eyes wide. Mhumhi glanced nervously at Kutta and saw she had put her ears back. “Don’t say anything,” he murmured. “I’ve no idea what I would say,” she replied, in the same soft tone. “That’s fine,” said Biscuit. “But think quickly. They longer you leave them in one spot, the more danger can come find them.” His blue eyes bored into them. “Especially if he is a male?” Mhumhi questioned. “You want to use Tareq in some sort of- some sort of breeding program?” Kutta wrinkled her lips. “We aren’t turning this place into some type of- some type of hulker breeding center!” Kutta snapped. Kutta seemed shocked into silence by the audacity of this. Mhumhi nudged her again. “We’ll think on it,” he repeated. “I hope you make the intelligent choice,” said Biscuit. ““A hulker’s hands can easily fix this sort of thing,” said Biscuit,” shouldn’t he be calling them human?